Easy to read LCD display. Repeat 4 minute snooze. Ascending alarm. Backlight on demand. Requires one ÒAAÓ battery (not included). 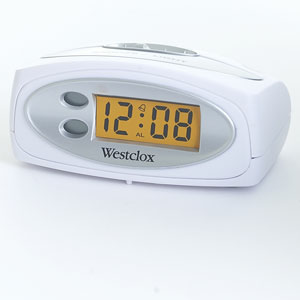 Independent alarm On and PM indicators. Silver accented color scheme. 0.5-inch LCD display. Snooze function. Light on demand. Battery operated.